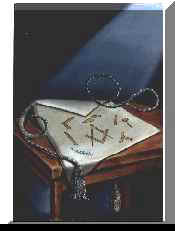 In Masonic symbolism the Lambskin Apron holds precedence. It is the initial gift of Freemasonry to a candidate, and at the end of life's pilgrimage it is reverently placed on his mortal remains and buried with his body in the grave. Above all other symbols, the Lambskin Apron is the distinguishing badge of a Mason. It is celebrated in poetry and prose and has been the subject of much fanciful speculation. Some Masonic writers have contended that initiation is analogous to birth, or our advent from prenatal darkness into the light of human fellowship, moral truth and spiritual faith. Much ancient lore has been adduced in an effort to show that the Lambskin Apron typifies regeneration, or a new life, and this thought of resurrection may be the cause of its interment with the body of a deceased brother. At least it will serve until a better reason is advanced for this peculiar custom in the Masonic burial service. The association of the lamb with redemption and being born again is expressed by John, the Apocalyptic Seer, who had a vision on the Isle of Patmos,and beheld the purified and redeemed "of all nations, and kindreds, and people and tongues," Of them it was said, "These are they which came out of great tribulation and have washed their robes and made them white in the blood of the Lamb." By many it has been regarded as a great religious symbol. In our present conception there are three parts of man, body, soul and spirit; what the body is to the soul, the soul is to the spirit, namely, a house or habitation, but in oriental thought there were seven parts of man, four earthly and three heavenly, four physical and three spiritual. The four sides of the square symbolized the four physical and the three sides of the flap, or triangle, symbolized the three spiritual parts of man. the apes of the triangle or point of the flap stood for the seventh part of man which was called Atma and which means the eternal spark, the divine flame, the indestructible spirit of the living God in every human being. In this aspect it means that God is not a looker on At the life of anyone; God is under every man, God is part of every man. A badge is either good or bad by reason of that for which it stands. aside from mysticism, I believe there are five distinct things of which the Lambskin Apron is a badge. Firstly, in its use, it is a badge of service. In his recent book on "Symbolical Masonry," Brother H. L. Haywood has an interesting chapter on "The Apron wherein the Builder builds," and says it "was so conspicuous a portion of the costume of the Operative Mason that it became associated with him in the public mind and thus gradually evolved into his badge." By it Speculative Freemasonry seeks to distinguish the builder and place upon the brow of labor the laurel wreath of dignity and honor. Secondly, made of Lambskin, it is in its fabric a badge of sacrifice. The Lamb in all ages has been not only an emblem of innocence, but also a symbol of sacrifice, and he who wears this Apron with understanding must be prepared for the time when hard things are to be done when trials are to be endured,and fortitude glorified. Thirdly, in its color it is a badge of purity. White is the clean color that reflects most light. In Masonry there are three great religious rites. One is discalceation, that is, entering a holy place or standing in the presence of God barefooted as a symbol of humility. It comes from a time whereof the memory of man runneth not to the contrary. When God appeared to Moses in the burning bush, he said, "Put off thy shoes from off they feet for the place whereon thou standest is holy ground." Another is the rite of circumambulation, that is, going around an altar from east to west by way of the south. Dr.Joseph Fort Newton said: "When man emerged from the night of barbarism his religion was a worship of light; to him light was life and love, darkness was evil and death; to him light was the mother of beauty, the unveiler of color, the radiant, illusive mystery of the world; his temple was hung with stars, his altar a glowing flame, his ritual a woven hymn of night and day." To him the Sun was the greatest of God's creations, it inspired his adoration and in all his religious ceremonies he followed its apparent course through the heavens, as though he were walking in the footsteps of the Most High. Through this rite, memories of that religion of the dawn linger with us in Masonry today. The third is the rite of investiture or purification;that is, the presentation of the Apron. In a qualified way it bears the relationship to the lodge that baptism does to some churches, it is the external symbol of an inner purification. The Psalmist asked: "Who shall ascend into the hill of the Lord?" and answering his own question said, "He that hath clean hands and a pure heart." The Apron when correctly understood is the pledge of a clean life, the testimony that a candidate means to live pure, speak true, right wrong, and reverence conscience as king. When we turn to the Ritual for its interpretation, we find the Apron to be an inheritance from the past, and so, in the forth place, it is a badge of antiquity, "more ancient than the Golden Fleece and Roman Eagle." A ministerial brother once said that the Masonic Ritual was couched in stilted phrases and extravagant language, and as an illustration referred to the ritualistic speech used in the presentation of the Apron. Let us see if he was right. The most specific way of conveying thought and expressing truth is by comparison. It is difficult to comprehend an idea unless we can correlate and compare it with something already known. the Order of Golden Fleece here referred to was founded in the year 1492 by Philip, Duke of Burgundy; the Roman Eagle became Rome's ensign of imperial power about one century before the Christian era, while the Apron has come down to us from the very sunrise of time. "Hebrew Prophets often wore Aprons," they were used in the ancient mysteries of India and Egypt, they were used by early Chinese secret societies, by the Jewish religious sect called Essenes, they were employed as emblems by the Incas of Peru, the Aztecs of Mexico, and the prehistoric races of the American continent. As a badge of antiquity, it emphasizes the value of the past. Blackstone, in his commentaries on the English law, said that in the making of a new law three things must be considered, namely, the old law, the mischief, and the remedy. No man can apply an intelligent remedy to an existing mischief without regard to the antecedent conditions out of which it grew. Present progress must be based on the accumulated experience and wisdom of the ages. Albert Pike said, "It is the dead who govern, the living only obey." "Every ship that comes to 'America got its chart from Columbus, every novel is debtor to Homer, every carpenter who shaves with a foreplane borrows the genius of some forgotten inventor." As a badge of antiquity the Apron exalts the greatness and glory of the past in its present contribution to human good and happiness. In the fifth place, the Apron is a badge of honor. It is declared to be "More honorable than the Star and Garter." Here we have another comparison. The Order of the Star was created by John II of France at the beginning of his reign in the middle of the 14th Century. It was a royal plaything and at the time of its formation its founder was engaged in acts of despotism and destruction. The Order of the Garter was formed by Edward III of England in 1349. It was composed of the king and twenty-five knights and originated in the false pride and fantastic pomp of medieval manners. Edward A. Freeman, an English historian, says: "The spirit of knighthood is above all things a class spirit. the good knight is bound to endless courtesies toward men and women of a certain rank; he may treat all below that rank with any degree of scorn and cruelty." "Chivalry is in morals what feudalism is in law. Each substitutes personal obligations devised in the interest of an exclusive class, for the more homely duties of an honest man and a good citizen." Freemasonry is in striking contrast to such conceptions. It stands for the dissipation of discord and dissension, for the promotion of peace, the pursuit of knowledge and the practice of brotherhood, for untrammeled conscience, equality of opportunity and the divine right of liberty in man, for devotion to duty, the building of character and rectitude of life and conduct. Its symbolical supports are wisdom, strength and beauty; the principal rounds of its theological ladder faith, hope, and charity. Its primary tenets are brotherly love, relief and truth; its cardinal virtues are fortitude, temperance, prudence and justice. Its temple is erected to the Master Builder, its Great Light is the Word of Revelation and at its center is an Altar of high and holy purpose. Like the shadow of a rock in a weary land, like a shining light in the window of a home, like a mother's kiss on a troubled brow and the breath of her prayer in the hour of despair, is the spirit of Freemasonry, calling man from the circumference of life to find God at the center of the individual soul. When we consider the messages delivered by these Orders and the Lambskin Apron - one speaking the language of class distinction, special privilege and the divine right of kings; the other telling the story of exact justice, equality of opportunity, and the brotherhood of man - it is not a stilted phrase and an exaggeration of speech to say that the badge of a Mason is more honorable than the Star and Garter. As a badge of honor, the Lambskin Apron spells out integrity, honesty of purpose, probity of character, and soundness of moral principle.